Role: Volunteers work on achieving the goals set out in the Care Management Plan, including doing educational and creative activities with the children and promoting interactive learning. Peru is an amazing destination to work with children in kindergartens and care homes, or with the elderly, in South America. Located on the Pacific Coast of South America between Chile and Ecuador, Peru is one of the more popular tourist destinations in Latin America. Exports such as coffee, potatoes and gold have done much to improve the levels of high unemployment, but low wages mean that many families still live in poverty and, especially in more rural areas, there is a real need for volunteers to help with caring for children. As well as working with children or the elderly, there are also opportunities for more experienced volunteers to assist with the training of staff in our partner organizations. Whatever your age, abilities, qualifications or level of experience, you can contribute to this vital development work during a college break, gap year, career break or just a vacation. Energy, passion and commitment to the work at hand is all you need to participate! All our Care projects in Peru are based in Cusco. There are four different placement options for volunteers: kindergarten programs, day care centres, working in a school with children with learning disabilities, or helping at a centre for the elderly. Our local staff will help you to find the placement that most accurately matches your skills and level of experience. Projects Abroad runs a pilot program in coordination with the Ministry of Education, where materials, activities and strategies are tried out before we try to implement them in other kindergartens. We are responsible for the in-service training of the kindergarten teachers in the region, so our volunteers are also welcome to help prepare materials for the training workshops. You will assist the class supervisor in all kinds of play-work activities, such as arts and crafts, painting, and teaching reading and writing. You may wish to develop projects with the children using your own interests in music, sports or drama, or you may wish to take a more observational role and lend the children support through providing friendship and assistance. We encourage volunteers to try new activities and expand the range of games and ideas the children will encounter. Working closely with individual children and identifying their areas of strength is a very important part of this placement. Volunteers work alongside local teachers developing resources and classroom activities to make the lessons more interesting. We aim for volunteers to contribute to the resources at the kindergarten during their placement, building up a bank of information that the teachers can use in their lessons. Volunteers can also work in Day Care Centres for children between 1 and 4 years old. Here you will assist the supervisors with general hygiene and with the caring for and feeding of the children. You may wish to develop small projects with the children using your own interests in art, music, sports or drama, and we will provide you with the resources necessary to assist you in this. A further care placement is at a special-needs school in Cusco. People with learning disabilities are often still regarded as one homogenous group in Peru, but the provision of support for many learning disabilities has changed dramatically in recent years. In line with this we are helping to implement a system focused on the individual, including art, drama and music therapies, and supporting life-long learning. During the holidays - between mid-December and March - care volunteers will usually either work at summer Day Care Centres for pre-school children or on a Community Project in the mountains. As a volunteer, you can also choose to work at a care centre for the elderly. We work with a centre run by the Catholic Church, where approximately 250 elderly people live. It is the biggest centre for the elderly in Cusco. Volunteers have an important role to play at the centre in providing companionship and care to those at the centre, and to offer much needed extra support to the staff. When you are not working directly with the elderly, you can help prepare social activities and workshops, or do community work such as painting and basic maintenance at the centre or local library. Please note, the local staff at the centre for the elderly do not speak English. You do not need to be able to speak Spanish to join this project, but we do encourage you to consider also taking our Spanish Language Course to enhance your experience in Peru. We try to take advantage of all of our volunteers’ talents and skills when organizing their Care placement. Volunteers can assist in improving the children’s’ competence and awareness in many areas of personal and social education, such as problem-solving, adjusting behaviour to different situations, and understanding others. Helping the children in these areas is vital in order to give them the best chance of living independently in the future. You can read more detailed information about the aims of the project in our Peru Care Management Plan. Volunteering on a care project in Peru is a chance to make a real difference to these children, not merely through the development of their social and life-skills, but also through exposing them to new ideas and cultures. And it is likely that you will learn as much from them as they do from you! 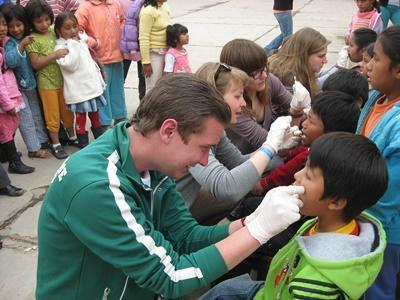 You can join the Care Project in Peru for two or three weeks if you don't have time to join us for four weeks or more. This project has been selected by our local colleagues as being suitable for shorter durations for both the host community and the volunteer. Although you will gain valuable cultural insight and work intensely within the local community please be aware that you may not be able to make the same impact as someone participating for a longer period. While you’re in Peru, you might also consider joining a 1 week Conservation & Environment Project. For more information, please visit our Rainforest Conservation & Environment Project in Peru page. Our Combinations Page explains how you can combine not only projects, but also destinations.